In the annals of comfort food sits the deliciously simple tomato soup. This versatile yet simple soup is the perfect food to warm you up on a cold winter's day or to make with your overabundance of summertime tomatoes. There are no short cuts with this recipe if you want the full flavor of fresh-from-the-garden tomatoes. Roma or plum tomatoes are ideal for tomato soups, however, you'll get a flavorful soup regardless of what you use. Some cooks even use several different varieties for a subtly complex undertone. In a heavy-bottomed saucepan, melt the butter with the onions over medium-low heat. Cook the onions until they are clear, and then add the garlic. Slowly, incorporate the flour into the butter mixture with a whisk. Add the chopped tomatoes, sugar, and chicken broth while whisking constantly. Bring the soup to a rolling boil and cook for about 20 to 30 minutes. Using a handheld strainer, remove the tomatoes and add to a blender. Purée the tomatoes and press through a sieve back into the soup. Stir the mixture together. Serve immediately with garlic croutons. This soup uses canned tomatoes, and two different types of cheeses to give it a creamy texture. In a heavy saucepan, melt butter with onions and cook until onions are clear. Slowly whisk in two tablespoons of flour to make a roux. Whisk in the two cans of tomatoes and hot chicken broth, and bring to a rolling boil. Cook the soup over medium-low heat for approximately 10 to 15 minutes. When the soup is thoroughly heated, stir in the garlic powder, Parmesan and mozzarella cheese. Continue cooking until the cheese is melted. 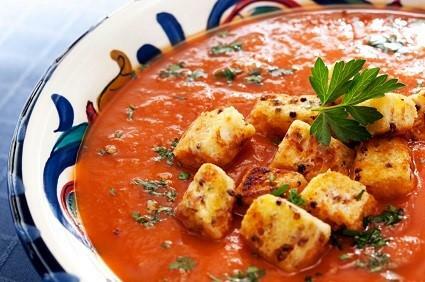 If you prefer that your soup have no chunks of tomatoes in it at all, remove the tomatoes pieces before you add the cheese, process in a blender, and then add back into the soup. Serve with artisanal bread. In the mood for comfort food, but don't want plain old tomato soup? Try these ideas to make your dish interesting. Add shallots instead of onions, and a dab (or two) of hot sauce. Make some creme fraiche and dollop that on top with a sprig of parsley. Add a half cup of puréed jalapeño or habanero peppers to the soup. Serve with whipped cream. Make a grilled cheese sandwich with extra crispy toast. Using a buttered pizza cutter, cut the sandwich into cubes and you have grilled cheese croutons to serve with your tomato soup. Go Italian by adding one-half cup of marinara sauce, two teaspoons of oregano, and one teaspoon of basil. Flavors of garlic, onion, and of course tomatoes make the soup a favorite for many. It also pairs well with almost anything, and during the summer you can chill it. Since tomato soup is so easy to make, there's no reason not to enjoy a bowl today.